St. Patrick's Day is tomorrow. I've got dessert made for both luncheon and dinner and the Irish soda bread is in the oven and the cookie dough for shamrock cutouts is in the fridge. But it is the 16th! Not the 17th. Alas, teatime this afternoon was shortbread and a cup of P G Tips, taken rather quickly for I needed to be back in the kitchen. But today is Teatime Tuesday and Friends Sharing Tea and I so wanted to share an Irish tea -- it is so close. So I went to my archives and found this delightful tea from 2010 -- A St. Patrick's Tea with two close friends! It's Saint Patrick's at Linderhof and two friends have joined me for tea. An Irish Tea! With my Emile Henry teapot (it's not Irish but is' green!) and an English tea set that is actually a pretty pale green and white -- not the beige and white that it looks here. An English pearl handled dessert fork and a linen napkin. Irish styled lace covers the table. Flowers -- pink rather than green. Flowers rather than shamrocks but in a Waterford vase. Cups of cups of Irish breakfast tea were sipped while we enjoyed the chocolate and Guinness cake. In the background, soft British folk songs by the Kings Singers. It was an Irish sort of day at Linderhof on this March 17th. And although none of us are really Irish, we did feel like we were in Ireland this afternoon. But between, I'll take time for tea -- tea for me with a pot of Irish breakfast tea and two of the Shamrock cookies. They'll be my hostess favors for my luncheon guests and for my lady dinner guests. What a beautiful St. Patrick's Day tea! Your chocolate and guinness cake looks absolutely yummy! Sounds like you are going to have a delightful day tomorrow, Martha. I really like your green teapot. I do adore the colour green! 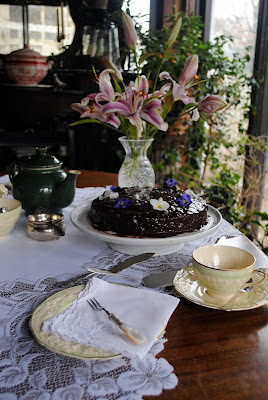 The lace table covering is lovely and your china teacups are very pretty dressed in their pale green. Thank you for joining me for tea and Happy St Patricks Day! You are more organized than me Martha, the soda bread is made but my Shamrock sugar cookies are not so I'll be scurrying tomorrow to get them baked. I like the dark green teapot, have fun entertaining tomorrow. What a lovely tea setting for St. Patrick's Day. Love the teacups, teapot and...everything! Would love you to link to my Tuesday Cuppa Tea linky, now open! Glad you are preparing for your St. Patrick's Day tea time! I hope you take photos for us to enjoy. Your repeat of the lovely tea party is a great way to celebrate the day. Have a wonderful week! Enjoy your St. Patrick's Day Tea tomorrow!!! And if I find the charmed leaves, oh, how I'll weave my spells!" Those cups and saucers are so beautiful with the raised work on them. They look either Wedgewood or Copeland. I don't know but wonderful! Everything on the table looks carefully appointed. Hope everything today was a great success as I am sure it was!